Inspired by solutions found on racing yachts rather than roller blinds, the stand has no springs, but is built around an innovative way to work with tension, the patented Modular Tension System - MTS® - that makes graphics media handling a breeze. All these features fit into a sleek, super light media roll that is easily mounted without using any tools. With the M2 you can carry multiple graphics with you and change them out on the fly: it takes less than 30 seconds to set up; the weight is around 6 kg (12 lbs), including case and graphic; and the graphic cartridge can be easily replaced when new artwork is needed. 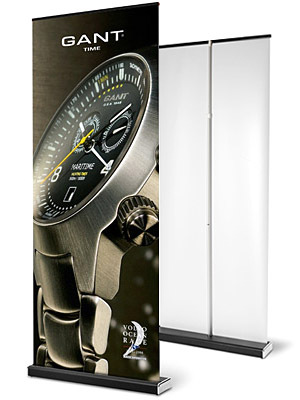 This is the hottest item in the backdrop/display manufacturing industry today for cost, convenience, durability and professional eye-catching appeal. The M2 comes with our Multi Strap Soft Bag™. The bag makes it easy for you to transport your stand and the padding keeps it safe. Graphic Size: 33.4" or 39.4" wide and 63" to 86.5" high (telescoping pole). Price includes printed pre-production proofs (all shipping charges additional).